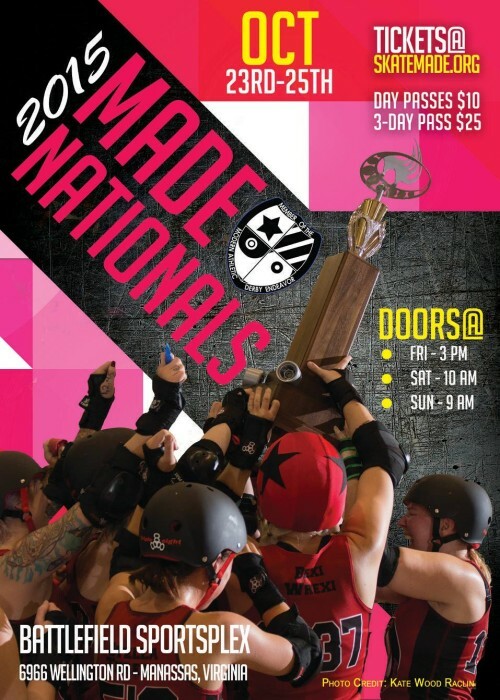 The Modern Athletic Derby Endeavor is presenting the 2015 MADE Nationals this weekend at the Battlefield Sportsplex in Manassas, Va. Eight teams consisting of various MADE leagues and skaters will contest championships in two divisions, one for women’s teams and the other for co-ed teams. Last year, the inaugural MADE championships went to Penn-Jersey Roller Derby in the women’s division and South Jersey Roller Derby in the co-ed division. Though PJRD isn’t back to defend — they’re focusing on the RDCL and MRDA now — South Jersey has returned with both co-ed and all-female squads and are looking to sweep the event. But MADE doesn’t mind a bit. The leagues and players that play the MADE game seem to be quite happy with how things are, continuing to do so despite being one of the minority derby organizations out there. Though it’s made some mistakes in the past, the level of enthusiasm among those in the MADE community is still high. That should be on display this weekend during Nationals. The MADE style of gameplay is very different than what most in the derby community will be used to, though it shares many common traits with other modern derby variations. We’ll touch on the rules differences below, but you can be sure that MADE games will be fast, furious, and very competitive on every jam due their employment of the pivot break rule and a generally low number of penalties. We’ll be able to see it all unfold live from the east coast. All 12 games of MADE Nationals 2015 will be streamed live through MADE for Speed TV, MADE’s new webcast portal, starting Friday afternoon. It’s completely free, though you will be asked to login to Livestream to watch the games. 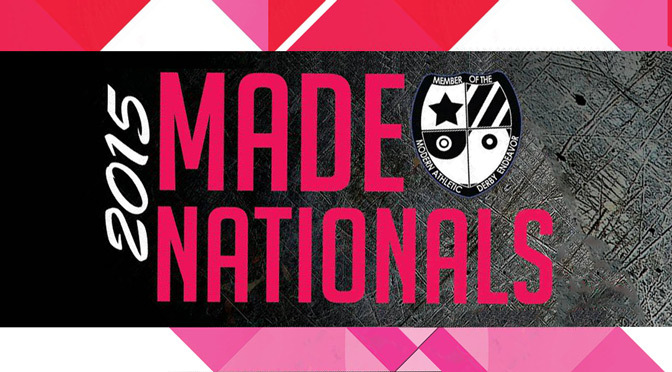 If you’re nearby and are inclined to see it in-person, you can get attendance and ticket info on the MADE Nationals 2015 Facebook event page. Of course, Roller Derby Notes will be following the action. Look up our Twitter @derbynotes using hashtag #skatemade for score updates and commentary from afar. Here’s a quick rundown of the tournament format, the participating teams, and the schedule, plus a quick primer on their rules differences for MADE newbies. The weekend will feature a straight-up round-robin within each division. The four women’s teams will each play one game against a different opponent on each day. Same deal with the four co-ed teams. After play on Sunday, the team with the best win-loss record in each division will be the winner. In the event of any ties for first place, an additional winner-take-all game will be played on Sunday between the two teams with the best points for/points against total. South Jersey and Fountain City are both fielding teams in both divisions. Fountain City has enough players to field unique rosters for their women’s and co-ed teams. South Jersey, on the other hand, has only 21 skaters total to divide among their two squads. Seven of them will be playing two games a day, and six games over the weekend. Brutal! Myra Wreckabitch of Hazard County is also taking the opportunity to pull double-duty herself, skating with the all-girls D.C. team in the ladies’ tournament as well as with her regular teammates in the co-ed division. Owing to the “let’s just play derby” nature of the organization, MADE’s roster rules are cool with players doing this across multiple divisions in the same tournament. The rosters for all the participating teams are available to view here. MADE roller derby is very different than the roller derby you may be used to seeing or playing. For starters, it’s dead-simple for to understand: The MADE rulebook is only 5 pages long. This level of simplicity makes it refreshingly easy for new players to pick up the game, but that comes at the cost of leaving broadly-defined aspects of the rules open to more interpretation. But MADE teams are — for the most part — okay with this. MADE gives its certified referees absolute authority in rules interpretation, which means they are more likely to give a “let them play” attitude towards skaters, instead of being bound to call penalties based on rigid definitions. This system can create issues as teams start to feel out how unfamiliar refs will call a game, but for the most part it helps cut out the riff-raff in terms of keeping all 10 players on the track for significant amounts of time. – Jammers & Pivots must start every jam in formation. If a jammer commits a penalty at the end of a jam, they remove their helmet cover and serve out the rest of their time as a blocker while a fresh jammer lines up behind the blockers at the start of the next jam. The same goes for Pivots, which must start on the single start line at the front of the pack. – Pivots can “break” to become a team’s Jammer for a jam. The pivot break rule, a holdover from traditional roller derby and as also seen in USARS, allows a team that does not earn lead jammer status to optionally send out their pivot to jam instead of their jammer. (No star pass required!) A pivot can never break out of the pack first — only jammers are allowed to do that, since only jammers can earn the advantage of breaking out with a lead. This is the most significant gameplay difference, which forces a team to continually defend against multiple opponents to earn a good offensive scoring chance. – Dynamic Lead Jammer status. Lead jammer is a privilege open to competition among both teams from the starting whistle to the end of the jam. The active jammer physically in the lead on the track is always the lead jammer, so if that jammer gets passed by the opposing jammer or goes out of bounds, they aren’t the lead jammer anymore and can’t stop the jam until they earn back the lead position. This means that a pivot can become a lead jammer if they break out of the pack and pass the opposing jammer on the track! – The Pack: 3 + 2 = 20ft. The pack is defined as 3 players from one team and 2 players from the other. This includes jammers and pivots. The very fluid nature of pack definition is offset by a fixed pack proximity of 20 feet. (There is no pack bridging in MADE.) With the additional engagement zones forward and back of the pack of 20 feet each, blockers have up to 60 feet of room to legally block and engage. Refs can force players to pack up immediately, and also to maintain a minimum skating speed; stopping on the track or skating clockwise is strictly forbidden. – Yield to Undo Track Cuts. There are relatively few penalties in a typical MADE game, and one of the reasons for that is how players are allowed to rectify illegal advancing by simply recycling to the rear of the pack. Jammers that cut on a scoring pass have the option to legally continue on without yielding, but may not call off the jam until they score a point. Which is probably not something a jammer wants to do with the opposing jammer hot on their tail! – Harsh penalties: 1 minute and 2 minutes. Fewer penalties in MADE are balanced out by them being longer. What MADE calls a 1-minute “minor” penalty is merely what everyone else refers to as a regular ol’ penalty. Out of Play, Illegal Contact, Track Cuts (if failing to yield), and so on. The “major” penalties are really major: A team loses a blocker for 2 minutes for any penalty that shows excessive force. You can also get dinged for a major for too many skaters on the track to start a jam, which is not ideal. – Co-ed considerations. MADE was designed from the start to be a game for men, for women, and for co-eds. To facilitate the mixed-gender game, and to prevent a male-heavy team from gaining physical advantage, teams can not field more than 2 men in a jam, and only one of them can be a position player (jammer or pivot). If a co-ed team wants to go ladies’ only for 90 seconds, that’s cool too. Update: A previous version of this preview erroneously indicated that a previous MADE tournament did not pay out prize monies. This claim was based on incorrect information, and is not accurate. We apologize for the error. MADE’s forerunner, the Old-School Derby Association, was founded in 2007. MADE spun-off in 2009, leaving the OSDA to die off a few years later. Empire State Roller Derby, then as Man’s Ruin Roller Derby, is a former OSDA champion participating at MADE Nationals this year. A regulation MADE track is 98’x59′ and has no stagger or variable width. The standard WFTDA/USARS flat track is 88’x53′ with a 2′ stagger. The extra straightaway length on a MADE track is to compensate for the naturally faster gameplay speed.